The winners of the Amazon HQ2 sweepstakes do not reside in the commonwealth of Pennsylvania. The 14 month competition between cities and states across the nation ended earlier this week with the company deciding to place their second headquarters in Long Island City, New York and Arlington, Virginia. A total of 238 bids were made from the beginning of the process, although when the company selected their 20 finalists, Philadelphia and Pittsburgh found themselves in the running to the end. Elected officials across the country have received flak from the left and the right over the lack of transparency during the entirety of the process, but after Amazon’s decision was made, the public now knows what Pennsylvania, Philadelphia and Pittsburgh promised in exchange for the second headquarters. Pennsylvania walks away empty handed, (although GoPuff announced it’s $4 million investment in Philadelphia plus 10 warehouses across the state on the same day of the Amazon decision) but elected leaders speaks about the decision as a positive experience, despite their offer being larger than the eventual winners. However, the largest offers were reportedly from Maryland with $8.5 billion and Newark and New Jersey offering $7 billion according to the Pittsburgh Business Times. Here’s what the offers entailed and the responses from a couple of elected officials. Pennsylvania: On Tuesday afternoon, Gov. Tom Wolf revealed the $4.6 billion offer over 25 years in taxpayer-paid incentives to Amazon. $100 million of the offer was for transportation improvements, according to the AP. After Wolf released the letter, also signed by state House Speaker Mike Turzai and state Senate President Joe Scarnati, to Jeff Bezos he explained his thoughts that Amazon had made a mistake, but was still proud of how Philadelphia and Pittsburgh fared in the competitions. 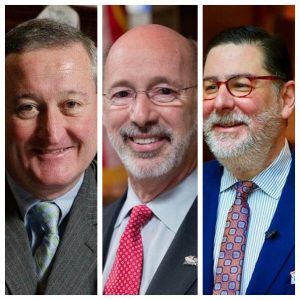 Philadelphia: On Tuesday afternoon, Mayor Jim Kenney released their offer, which includes an additional $1.1 billion in tax breaks over 20 years, coupled with the offer from Wolf’s administration. Billy Penn’s article takes a deeper dive into what Philadelphia’s offer shows and doesn’t show. The Tribune Review also broke down how the money was intended to be allocated. Peduto said Amazon was complimentary of Pittsburgh and the future of the city, despite not selecting them as their home, while Allegheny County Executive Rich Fitzgerald compared it to getting to the Super Bowl, but not walking away with the Lombardi Trophy. “It’s better than being 8-8 and not making the playoffs. You’ve reached the finals. Yes, you want to win, but the fact you’re there is a big deal,” he said according to the Pittsburgh Post-Gazette. Personally I am glad that the Pennsylvania taxpayers are not on the hook for a gift of $4.5 billion to a billionaire many times over. This type of cut throat corporate shopping around has to come to an end. So PA offered $4.5 billion to get a company to invest $5 billion? And we didn’t get them! It shows how poor of a state this is for business. What a sad thing and an incredible failure by the governor. When it came to getting a generational investment in PA from a global company, Tom Corbett succeeded. Tom Wolf did not. You couldn’t even buy two tires without them messing under your hood and telling you that $1500.00 of work needed done. Turned on them long ago. But truly sorry for all the jobs lost and inevitable hardships, though. Pretty tough outcome. Something wrong about how Amazon gathered all that data on all the so-called competing states—to benefit itself. A sense of the unethical to me. Pennsylvania will be fine. I’m still trying to figure out how Sears collapsed so quickly.